(10-21-2017 10:55 AM)bones Wrote: I like these beta drivers more because of the support for WDDM 2.3 and SM6.0. And they finally fixed voltage spikes for DXVA which were introduced in 17.7.2. One more good thing is that they put a switch that lets you use a blockchain compute driver and revert to gaming driver. I'm not seeing any issues with the beta driver either. What exactly are you doing that isn't working? What video card do you have? Are you using DVI? Any adapters? Asus RX480 8GB, HDMI to DVI cable. (10-22-2017 12:16 PM)bones Wrote: Asus RX480 8GB, HDMI to DVI cable. Using an HDMI-DVI cable makes it work like single-link DVI, which limits you to 165 MHz pixel clock. The patch is supposed to get around that, but it looks like they added another check in the driver at some point. I will look into that. 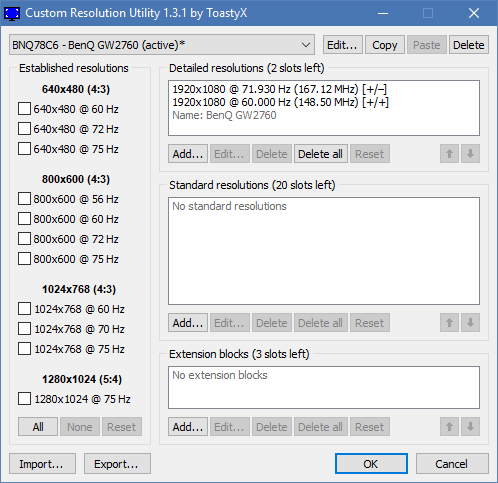 For now, you should be able to get under 165 MHz pixel clock by reducing the horizontal/vertical totals. Then you won't need the patch at all. Try reducing the vertical total to 1100. 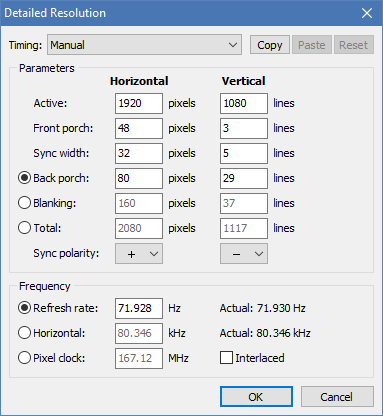 If that doesn't work for your monitor, try reducing the horizontal total to 2048 and set the vertical total to 1111. That'll also get you closer to 71.928 Hz. What driver were you using when it worked? It looks like the check was added in 17.7.2. I will have to update the patcher for this. No, the refresh rate wouldn't have been available if the check was working.